The January blues is a real phenomenon, rooted in physiological and psychological causes. My latest Southern Star piece (pictured) offers some practical advice on how to overcome this seasonal phenomenon which affects significant numbers in Ireland. 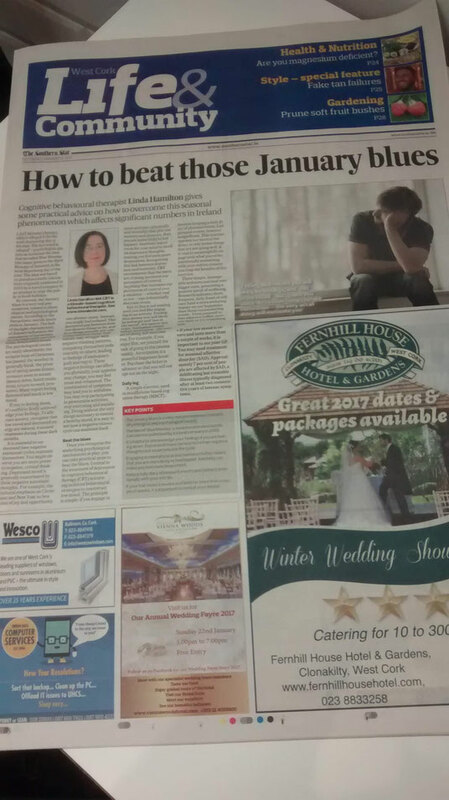 The article can be accessed on the Southern Star website at http://www.southernstar.ie/news/roundup/articles/2017/01/28/4133559-how-to-beat-those-january-blues/. LAST Monday (January 16th) is alleged to be the most depressing day of the year. The key word is “alleged” – psychologists dismiss as nonsense the idea that so-called Blue Monday (the name given to the third Monday of January), is the most depressing day of the year. The idea was based on pseudoscientific calculations originally publicised in 2005 by a travel company in an attempt to urge the public to book holidays. By contrast, the January blues is a very real phenomenon, rooted in physiological and psychological causes. According to the Samaritans, suicide levels peak in January. The lack of daylight characteristic of January influences the stimulation of hormones, such as melatonin and serotonin, which affect mood. The psychological causes are easily identifiable; the escapist buzz of Christmas has passed, the weather is generally bleak, the promise of spring seems distant, stressors seem to mount (money debts, failed resolutions, return-to-work pressures). Many report feeling flattened and stuck in low mood. If you’re feeling down, it's useful to firstly acknowledge your feelings. To alleviate anxiety, recognise that low mood and decreased energy are natural, transient responses during these dark months. It is essential to understand how negative emotional cycles maintain themselves. You might observe you are more prone to negative, critical thinking. Depressed mood is generally exacerbated by these negative automatic thoughts (continued below). For example, the cultural emphasis on Christmas and New Year as beacons of joy and opportunity can alienate many. Instead, you might feel isolated. This perceived gap between how one desires things to be, and how things actually are, can compound low mood. Individuals may struggle with negative thinking patterns, comparing themselves unfavourably to others, leading to feelings of inadequacy, guilt and regret. These negative feelings can affect you physically; your appetite may change, you may feel tense and exhausted. The combination of symptoms may lead you to withdraw. You may stop participating in pleasurable activities, stop exercising and socialising. Doing without the very things necessary to sustain a healthy mood, it is easy to see how a negative vicious cycle can maintain itself. Once you recognise the underlying psychological mechanisms at play, you can take practical steps to beat the blues. Central to the treatment of depression in cognitive behavioural therapy (CBT) is learning to devise behavioural strategies to counteract low mood. The principle is simple: if you engage in more activities (physically and mentally) that give you mastery and pleasure, then you are more likely to feel happier. Inactivity leaves room for your mind to dwell on depressive thoughts, making you feel even more despondent. Recognising this link between depression and inactivity, CBT recommends that the mere act of doing increases our perception of control. Anything that increases our perception of control over a situation — whether real or not — can substantially decrease stress. Key to this is not waiting until you feel like engaging in an activity. Feeling blue means you will likely be lethargic and “not in the mood”, but ignore this voice. Activation comes before motivation – the very act of doing will motivate you. For example, if you enjoy film, set yourself the task of going to the cinema weekly. Anticipation is a powerful happiness booster. Purchase the ticket in advance so that you will not opt out on the night. A simple exercise, used in mindfulness-based cognitive therapy (MBCT), involves keeping a daily diary of pleasant events. List pleasant events, however insignificant. This exercise opposes our natural tendency to only notice things that are not going well. It is vital to meaningfully engage with what you write; emotionally connecting with your entries ensures you reap the benefits of this exercise. These simple, manageable activities can lead onto bigger ones, generating a positive spiral of wellbeing. Research indicates short, frequent, daily doses of self-care have a more enduring impact on our happiness than those occasional big events. Treat yourself to that take-out coffee, exercise daily or try something new. * If your low mood is severe and lasts more than a couple of weeks, it is important to see your GP. You may need treatment for seasonal affective disorder (SAD). Approximately 7 per cent of people are affected by SAD, a debilitating but treatable illness typically diagnosed after at least two consecutive years of intense symptoms.